Executive Chef Mark Ladner of Del Posto shares his recipes for Traditional Italian Veal Classics as part of the New York Culinary Experience hosted by New York magazine and The International Culinary Center. Taking the veal class with Executive Chef Mark Ladner I learned that he opened the Michelin-star Del Posto restaurant in 2005, is a chef partner at Lupa Osteria Romana and Otto Enoteca Pizzeria, and co-authored the cookbook, Molto Gusto with Mario Batali. Educated at Johnson & Wales he moved to his native Boston and worked with Todd English at the original Olives restaurant. He has worked with renowned Chefs Scott Bryan and Jean Georges Vongeritchen, and as a Sous-Chef, he opened Babbo before moving on as the Head Chef to open Lupa and Otto. As the Executive Chef at Del Posto he likes to blend rustic Italian flavors and promotes responsibly raised and locally grown products. During the 2+-hour class we worked with superb cuts of veal as we pounded them out, spread a thin layer of mushroom mixture, rolled and learned how to tie the braciole. Executive Chef Mark Ladner and Sous-Chef Matt Abdoo took the class step-by-step through the recipes after we had donned aprons, unsheathed our knives, and opened our containers of products. The first recipe we worked on was the Vitello Tonnato, and then with our newfound knowledge, we worked on the Veal Braciole. Having had the hands-on time with the recipes, I can say that it is not difficult, but it does require that you pay attention to each step, as you would not want to over cook a nice cut of veal. 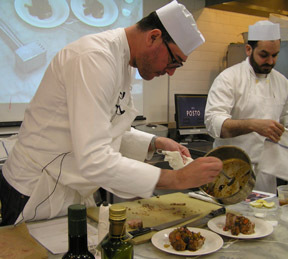 In addition to the Veal Braciole, the class cooked up the Vitello Tonnato from the beginning, to plating, to tasting. Both dishes may be found on the Del Posto menu and both recipes have many steps that can be done a day or two before. Thus on the day of the event, you only have to plate and serve the food, what a nice option for the host or hostess. Method: Sweat the garlic and shallots until soft. Add red pepper flakes, and porcini. Cook until dry. Allow to cool, then chop finely. Add finely chopped parsley and Parmesan. Method: Sear the osso bucco in a large, heavy bottomed Dutch oven, then add the mirepoix (carrots, onion, celery). Let the vegetables soften, then add the tomato liquid. Allow this mixture to reduce, then add the prosecco and reduce again by half. Finally, add the chicken stock and cook until the osso bucco is fork tender. Let cool in braise, and then pick into bite size pieces. Method: Take one pounded veal tenderloin, and spread a layer of diced porcini on the veal. Roll the meat up with the porcini mixture in the interior, as you would with the filling in a jellyroll. Tie up the rolled tenderloin neatly with butcher's twine. 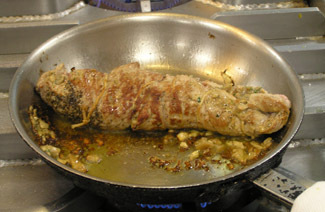 Putting it all together: Sear the rolled braciole on all sides, then cook in the oven until it is medium-rare. Let it rest for 10 minutes and slice. Place the sliced braciole in a pot with the osso bucco braising liquid, one piece of osso bucco per person, and all of the braised vegetables. Coat the braciole in sauce, plate braciole. Finish sauce with raw Barolo and pepper. Fan the slices of braciole out on the plate, and add vegetables, and sauce, finally, garnish with broccoli rabe florets, and a hearty drizzle of good olive oil. Note: You can buy Activa TG TRANSGLUTAMINASE online or in specialty shops. Method: Preheat oven to 300° F (149° C). Butcher veal clot, removing all sinew from the flat iron cut. Roll flat iron cut with Activa, spread along the seams as Activa reacts with the protein of the meat to seal the edges. In a pan, roast the onions and carrots with a little oil. Add red wine, reduce until completely dry. Add veal stock, tuna, anchovies, and lemon peel and bring it to a boil. Remove from heat. In a deep pan, layer veal and cover with veal stock sauce. Cover with parchment paper and aluminum foil. Place pan into the oven and cook for 3 to 3 ½ hours or until tender. When tender, remove meat from pan, and reserve the braising liquid and vegetables. Discard the lemon peel. Blend the vegetables and reserved liquid, and pour back into your pan. Put the meat into the purée and allow to cool/marinade. Method: Blend everything together except for the oils. Be careful to add xantham slowly to avoid clumping. Emulsify in oils. Season to taste and pass through a fine strainer to smooth. Portion veal to 1-ounce cubes, store in the sauce in a sealed container in the refrigerator, and allow to "funkify" for three days. Method: Blend olives, squid ink, and water together. Pass through a fine mesh strainer to smooth out clumps. Break bread into bite-size pieces, and soak in olive purée overnight. Strain, and place bread on top of a paper towel lined cookie sheet. Place tray in a very low oven - about 200° F (93° C) - and bake until the bread has the texture of croutons. 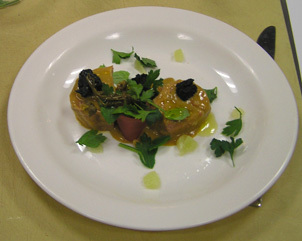 To Serve: Smear veal/tuna sauce on plate. Place tuna at an angle. Place two cubes of veal covered in sauce. Put five croutons on plate. 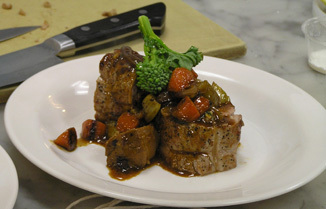 Place caper berries on veal. Make a salad with basil, parsley, parsley stems, fried capers, fried breadcrumbs, dressed with oil and Maldon salt. Place salad onto plate. Artfully arrange lime segments around plate to finish. 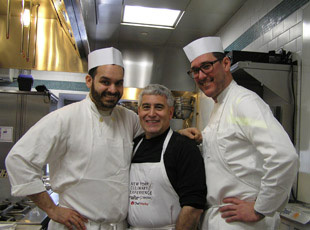 Read about Chef Mark Ladner's class in the Gastronomy section.